The art of the presentation infographic isn’t new. But info-graphics are certainly making a rush for attention right now. That’s probably a good thing for presenters planning their next presentation. The infographic lends something to a PowerPoint or Keynote presentation that’s distinctly different to photographic images, let alone clip-art. Undeniably there are good presentation infographics and there are those that require more work. But there are also those that really resonate design quality and sound production values. And there are others that just don’t cut it as informative graphical devices. One quality production has caught our attention this week. It’s the work of the team at the doghousediaries. We’ve shown a small picture of their work above. But you should really take a look at their larger image on a bigger screen. Plus, you can see a full-size version of the infographic at their site. Their presentation infographic is fun and informative at the same time. Undoubtedly someone, somewhere will take offence at its subject matter. But…the information sources used to create the infographic look reasonable enough. And that’s important. The presentation infographic has to show off sound information in a graphically engaging fashion. But this particular example does that in a brilliantly quirky fashion. 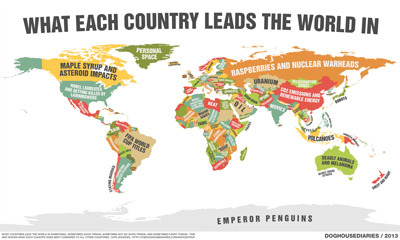 It shows off how each country (or thereabouts) manages to lead the world…at something. Those “somethings” are odd. They are very odd. But the statistics are there to prove it! Of course the infographic does have some omissions. I looked for Ghana and Cote d’Ivoire for a suggestion of cocoa leadership. But there was nothing. Oh well. And their presentation infographic does have some discrepancies. Since Brazil doesn’t lead the world in Brazil nuts any more! That leadership position is taken by Bolivia with 50% of current world production. The infographic doesn’t explain how and why Brazil’s forests have lost their premium producer position. But we can probably guess. And that’s part of the job of a good presentation infographic. It gets you thinking about the data sources, causes and effects in a fashion that often eludes us when we see data tables in another presentation. You can always learn more about how to present information on a presentation training course with Time to Market. So, you can choose to attend a public course or, perhaps, organise a corporate training event at your own offices. It’s your choice.